1. Peel and core the pineapple, then cut into 1/4-inch-thick slices. I used pineapple corer/ slicer, which cores and slices an entire pineapple. 2. Mix the sugar and water in a saucepan over medium heat. Cook, without stirring, for about 3 minutes or until bubbles start to appear and you see dark color syrup around the edge of the pan. 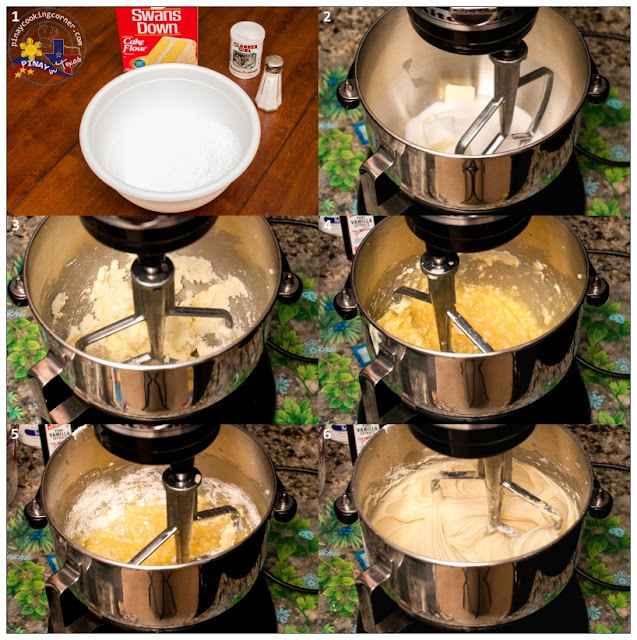 Swirl the saucepan in a circular motion so the sugar caramelizes evenly. Keep swirling gently until the caramel is medium golden brown. Turn down the heat to the low and whisk in the 4 Tbsp. butter. 3. Add the pineapple and gently stir to cover with syrup. 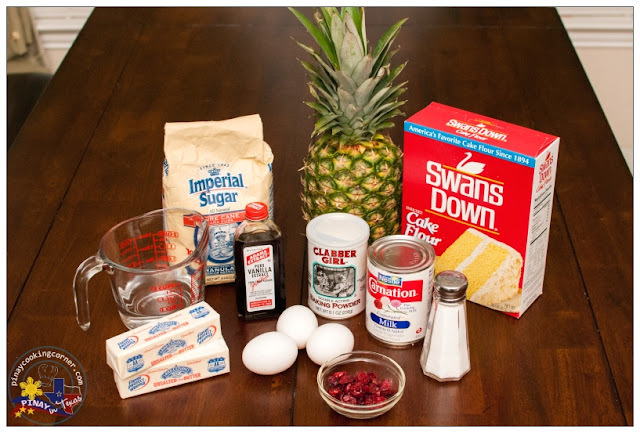 (You will notice that the syrup will harden after adding the pineapple...but it will be liquidy again.) Simmer for 10 minutes or until the pineapple slices turn golden brown. 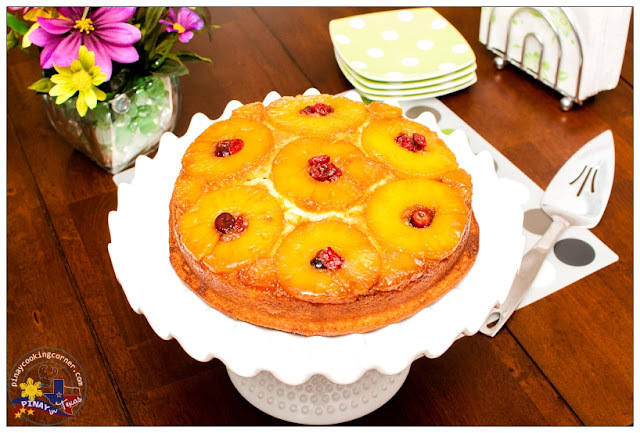 Transfer and arrange pineapple slices to a slightly greased 9" round baking pan. Continue to simmer syrup for about 3 minutes more or until thick. Pour on top of the pineapple slices. Arrange dried cranberries in the center of the pineapple slices. (optional) Set aside. 1. Preheat oven to 350F. In a bowl, sift all dry ingredients and set aside. In another bowl, cream butter and sugar at medium spped until light and fluffy. Add eggs, vanilla extract, evaporated milk and water. Continue mixing for about 1 1/2 minutes or until all ingredients are well blended. Turn speed to low and gradually add the dry ingredients making sure to scrape the sides of the bowl occasionally. Increase the speed to medium and mix for another 1 1/2 minutes. 2. 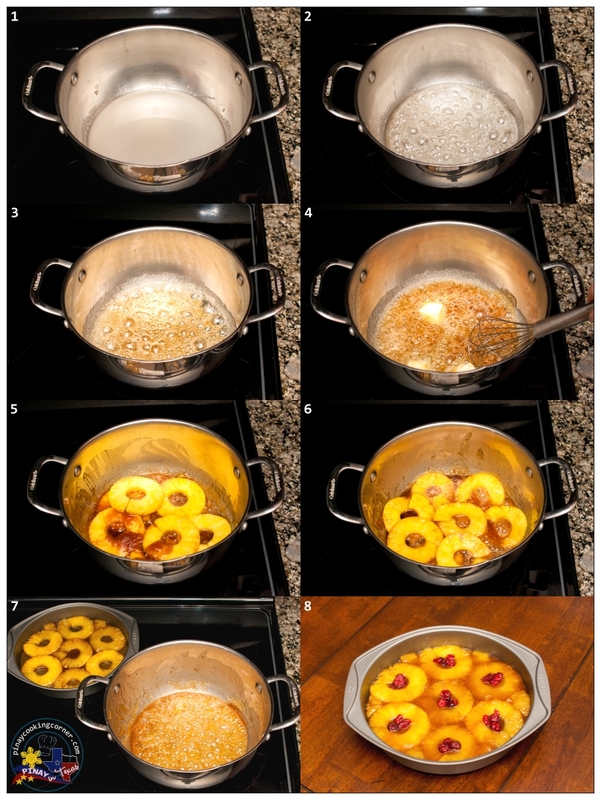 Pour batter into pan with caramelized pineapple. Bake in preheated oven for 30-35 minutes or until toothpick inserted in the middle comes out clean. Remove from oven and place on a wire rack to completely cool down. Run a sharp knife around the edge of the pan and then invert the cake onto a serving plate. This is really nice and it's one of my favorites. This is a must share. thank you, Tina! That is yummy cake Tina, Glad to know that your daughter love cooking, yes this cake is pretty too. I am afraid make this as my hubby will say it is sugar overload. I will try a smaller version. YES this looks delicious! I love that you used fresh pineapple not canned. My mouth is watering! YUMMY~! hi tina. this reminds me of a resto in Calapan - Nipa Hut. we used to go there when i was a kid and i remember eating this kind of cake.thanks. Oh my your daughter is a real foodie. Only foodies enjoy reading a cookbook. I remember my sisters used to find it weird that I like reading cookbooks. Beautiful cake Tina! 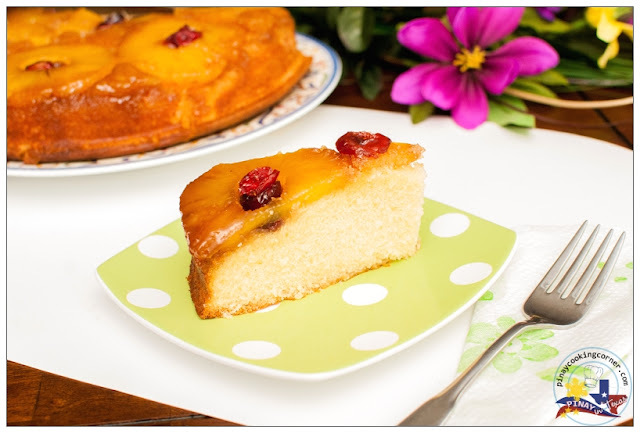 I haven't made upside pineapple cake since long and your post reminds me to revisit this cake in my kitchen. Wow Tina its great to have an aspiring chef at home they are great help. 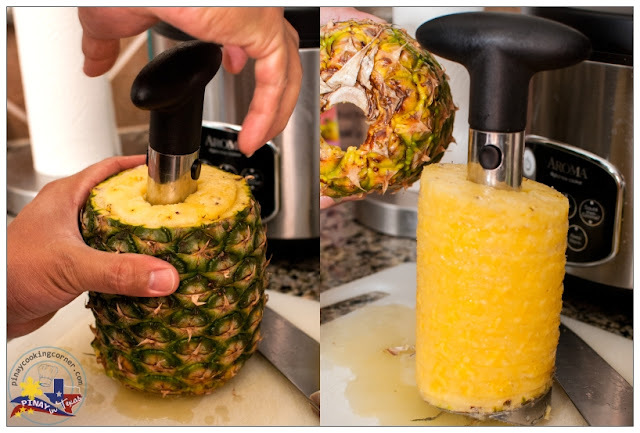 I love the cake as for the device to core and slice pineapples its amazing. Never has seen or heard of one before. 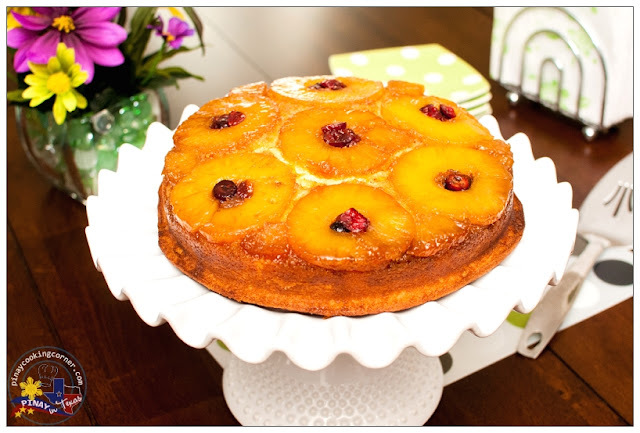 Nice to have a daughter that enjoys cooking/baking...the upside down pineapple cake looks fabulous...I would love to have a slice of this cake. I got this recipe from Goldilocks Bakebook and it always works fine for me, so I can't say what goes wrong when you're doing it. Regarding the syrup, I think you're not doing it thick enough that's why it mixes with the batter. Just cook the syrup longer until you achieve a thick consistency. Am trying to make mamon with butter, but the result of the batter not spongy as expected, i just put the butter on top of the mamon while waiting to cool down, can u suggest what am gonna do? I guess the vegetable oil is causing your problem. You see, if you want to achieve a spongy texture, there should be very little fat content in your batter. 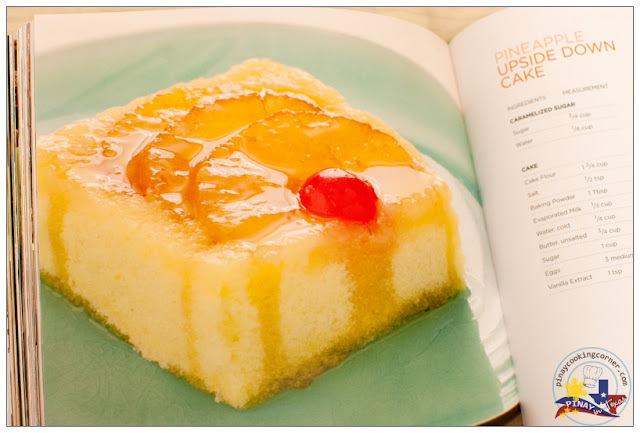 Have you tried following the recipe here on PiTCC? Maybe it will work better for you. Check it out! You have introduced me to your corer/slicer. That makes life so much easier!